Dress for the occasion. Impress for the moment. It is all about time and place. While a well-fitting race suit certainly is the right choice for a day at the track, when out and about on your streetfighter or naked bike, sometimes the situation calls for a different but equally well designed, equally Italian, set of gear. For instances like this, the new Dainese Street Rider Leather Jacket has been released. Designed for the sophisticated street rider who wants to look equally good whether walking around town or riding on the bike, the super-soft, Nubuck-finished cowhide and casual style really resonate with the power cruiser crowd. Coming in both black and dark brown to accommodate a multitude of bikes and styles, the fashion of the Street Rider also translates well into comfort. Additional features such as a 3D bubble liner create an incredibly comfortable jacket. At the same time, the Street Rider does not forget that it is a motorcycle jacket at heart. 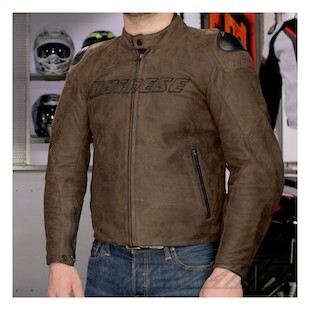 With features such as a full protection package, double pockets for the new Dainese split chest plates, and external shoulder plates, there is no mistaking this jacket as anything less than an incredibly solid motorcycling option. The Dainese Street Rider Perforated Leather Jacket is also available for those days when a solid leather shell is simply too hot. With all of the same comfort and protection features as the Street Rider, the perforated version will help keep your body temperature lower as it is more conducive for the flow of air throughout. If you are riding in a warmer climate or are someone who heats up easily, this is a great option for you. Powering around the city has as many perils (and probably more) than the high speeds of the racetrack. At the same time, your style and comfort have to fit the occasion. For times such as these, Dainese offers the new Street Rider Leather Jacket in both a perforated and non-perforated version as part of their new 2015 Collection.